from there, has wit or skill to tell about. "I don't know," said the High King. "It reminds me of somewhere, but I can't give it a name. Could it be somewhere we once stayed for a holiday when we were very, very small?" What is Heaven like? What can we learn from visions of Heaven that will give us a renewed sense of purpose here on earth? How can we defy that old saying, Christians are so heavenly minded, "they are no earthly good?" A Spirit-filled vision of Heaven should give us hope for the future, and a purpose for the present. 3 Many peoples will come and say,“Come, let us go up to the mountain of the LORD, to the temple of the God of Jacob. He will teach us his ways, so that we may walk in his paths.” The law will go out from Zion, the word of the LORD from Jerusalem. Ezekiel chapter 1 offers us a strange and convoluted vision of heaven with winged beasts a giant wheel or two, bright lights and other assorted oddities. The Prophet Daniel in chapter 12 verses 1-3 offers a vision of what will happen at the end of days and gives a vision of what happens to those who are ushered into God's glory. The book of Revelation is chock full of visions of heaven, but chapters 4 & 5 offer some of the most bizarre and interesting with images of a throne room with a sea of glass, beasts, elders, a slain Lamb with seven horns and seven eyes... it's pretty awesome. I was reading a book by Billy Graham on Heaven and in his book he made a statement to this effect: You shouldn't need to rely on the stories of people who have had NDE's, you should just trust the Bible, God's promises, and Jesus' words. But sometimes those of us who aren't Billy Graham need something more. Which brings me to some truth about NDE's. While there are plenty of people who try to discount them, and come up with all sorts of scientific theories that explain them away, there's a lot that can't be explained. Emily Williams Kelly, a professor in the University of Virginia's Division of Perceptual Studies has interviewed hundreds of people who have had an NDE. Her research, she admits, "...opens up the possibility that these experiences are what they say they are and we have to take that seriously." So it's evident that there is something to these visions, which makes the bizarre visions that we find in Scripture...not that bizarre. So what's it really like in Heaven? I have to admit the Protestant vision of Heaven is pretty boring. The Reformers in the 16th and 17th century took the fun out of it. As an heir to this tradition, I was regaled as a child with descriptions of Heaven as a place with streets of gold, white buildings, huge pearl gates and all sorts of precious gems all over the place. In Heaven, we were told, we would worship God all of the time. One pastor even declared that it would be like "one eternal church service." Really? This sort of Heaven is not that appealing. I remember as a kid I didn't want to go there. I pretty much hated sitting in church and thought the services lasted forever even on this side of eternity. On top of that, the Heaven that was described to me was fairly pristine. It was like visiting your Great Aunt Tessie's house where you couldn't touch anything and where the couches were covered in plastic. But what if it's different? Can you imagine a place where time and space had no constraints over you? Can you imagine a place where you would experience perfect peace? Can you imagine being filled with the most unbelievable joy you have every felt? These are just some of the things that people who experience NDE's claim to have felt during their glimpses of Heaven. And what will we do there? People who have glimpsed Heaven agree with the visions in the Biblical witness. We will see Jesus in Heaven, and he will be there in his resurrected body. We will sing in Heaven. Virtually every person who glimpses it, relates that in Heaven there is music the likes of which they have never heard before---and there is singing as well. Don Piper sang hymns that he knew from his life in church. Colton Burpo sang Jesus Loves Me and Joshua Fit The Battle, songs that he learned as a four year-old in Sunday school. We will learn in Heaven. Many people (including the prophets) have things revealed to them--some of of which they can remember and others they cannot. This tells us that we enter Heaven as finite beings. To know everything would mean that we are God, and we are not. So our time in Heaven will be spent learning as well as worshipping. We will be one in Heaven. People who experience NDE's relate how they feel at peace with everyone they meet---including people they didn't really get along with in life. None of that matters. But here's the thing... Heaven is not where we will live forever. Our eternal home where God will come to dwell among his people is called the New Earth. In John 14:1-4 Jesus tells his disciples "in my Father's house are many mansions..." Lots of people take this literally. But the word in the original Greek is monai which means "abiding place," "way station" and "place of halt on a journey." In Revelation 21:1 we have this: Then I saw a new heaven and a new earth, for the first heaven and the first earth had passed away, and there was no longer any sea. 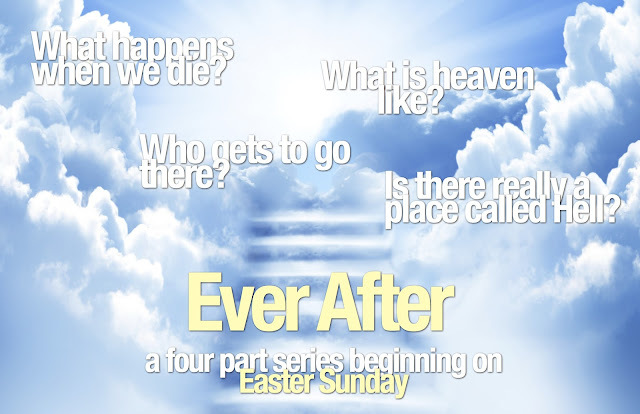 Granted, it's hard to know for sure what Revelation is all about---but this idea of a new heaven and a new earth is something that comes up often in John's vision, and reflects other prophetic passages found elsewhere in the Old Testament and other Early Christian writings. God is going to make everything new---us, the earth, Heaven... The fact that God will be with us in this New Earth makes it Heaven. The present earth is bursting with suggestions about what it will one day become. We can see beauty, we can see potential and we live into the hope of that. 2 Peter 3:13 states: But in keeping with his promise we are looking forward to a new heaven and a new earth, where righteousness dwells. According to N.T. Wright, the transition from the old world to the new will not be destruction of the old, but it's radical healing. In the first sermon of this series, Paul declares that all of Creation is groaning and yearning for this transition, which will be a resurrection in the same vein as our own bodily resurrection. Heaven, God's dwelling place, the New Earth---all of it---are closer than you think. Like Jacob who saw angels entering and leaving this realm for the Heavenly realm... Like Moses who realized he stood on holy ground when a bush he'd passed for 40 years suddenly appeared to be on fire... Like the prophets who glimpsed Heaven... Like the disciples who saw Jesus talking with Moses and Elijah... There are places and moments when the veil between our reality and God's reality is very thin. One glorious summer a little over ten years ago I studied at Christ Church College in Oxford England for an entire semester. I developed a habit of taking a walk in Christ Church Meadow very early in the morning. One morning the sun was peeking through the trees and glimmering over the meadow. The smell of flowers was in the air and I could hear the sound of the river somewhere in the distance. Birds sang. I walked toward the meadow and suddenly it felt as though everything slowed down a bit. The air was thick around me. Colors were brighter. The light was different. I was struck in that moment with a vision of walking in the meadow with my wife and my young son. And I felt perfect peace. I sat in that moment wishing that it would never end. The Hebrew word kavod describes the glory of God---as "heavy" or "thick." This is what I experienced---the heaviness of God. The thickness of the air, the difference in the light, the colors... all of it. It was a glimpse of the glory of God, I am convinced of it. I believe that the peace we feel there is possible here. I believe that the oneness we experience there is possible here. I believe that the presence of God we will know there can be known here. We cannot grow weary in doing good. We cannot stop sharing the story of the Gospel. We must tell the lost, the lonely and the broken that another world is possible, and that for those of us who put our faith and trust in Jesus Christ---it is literally one breath away.